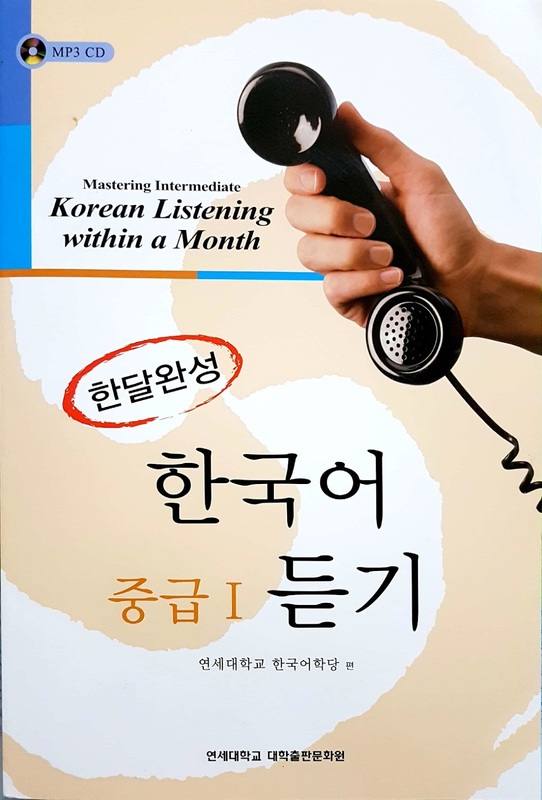 Korean Listening Intermediate I within a month (in Korean: 한국어 중급 1 듣기 한달완성) is a textbook developed to help Korean learners who have completed the beginner's course improve their listening ability in the intermediate level through various listening strategies, fingerprints, and conversations to prepare for the TOPIK test. In this book, various pictures and paintings are inserted to help Korean learners to understand and also have interest in the corresponding topic. The book consists of 20 lessons with various tasks and activities in each lesson. 제1과 독방은 하숙비가 얼마예요? / How much is the lodging fee? 제2과 이번에 대학에 입학한 신입생이에요./ I am a newcomer in this semester. 제3과 이야기하다가 친구가 됐어요. / We became friends after talking for a while. 제4과 차가 왜 이렇게 밀리지요? / Why is the road so congested? 제5과 2번 창구로 오십시오. /Please come to the window number 2. 제6과 즐거운 여행 되시기 바랍니다./ Have a joyful trip. 제7과 여러 나라 동전을 수집하고 있어요./ I am collecting coins from various countries. 제8과 인터넷으로 예매하고 극장에 가요./ I book the ticket in the Internet and go to the cinema. 제9과 저는 찜질방에 자주 가요. / I often go to the sauna. 제10과 이쪽에 있는 머리핀은 얼마예요?/ How much the hairpin over there? 제11과 피부가 좋아질 수 있을까요?/ Can it improve my skin? 제12과 TV로 영어 강의를 들어요. / I listen English lectures on TV. 제13과 저는 평소에 김밥을 즐겨 먹어요. / I enjoy to eat kimpap. 제14과 감기에 걸린 적이 거의 없어요./ I hardly caught a cold. 제15과 여보세요, 거기 119지요?/ Hello, is it 119? 제16과 결혼하고 싶은 생각이 별로 없어요./ I don't even think of getting married. 제17과 일이 적성에 맞지 않아서 힘들어요./ It's hard because the work doesn't suit my aptitude. 제18과 오늘 2차는 어디로 갈까요?/ Where will we go in the 2nd round? 제19과 앞으로는 꼭 두 손으로 드릴게요./ In the next time, I will definitely give by using 2 hands. 제20과 세배할 줄 알아요?/ Do you know about New Year's bow? Do you have the beginner level? This book does not have the beginner level.